Did you know: • Blind veterans celebrate 100 years of support by UK charity. 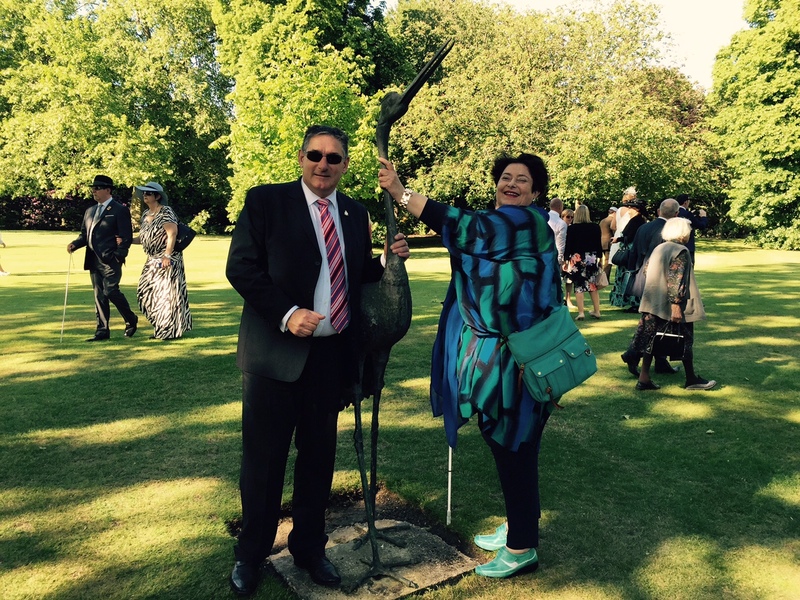 • Royal garden party marks blind ex-military centenary. • Armless mermen support royal folly at Palace. About 7,000 blind ex-military men and women (with their guides) were negotiating the paths, lawns and tea tents at Buckingham Palace in June. The Royal Garden Party celebrated 100 years of St Dunstan’s (now Blind Veterans UK) – created in 1915 to help those blinded by serving in World War 1. Even during her final days, Mummy was regaling nurses with her plans for her fourth Palace visit, worrying about what she would wear and how the ambulance would get there. We had struck a bargain of hope: she would get well and I would take her. It took much more reassurance to persuade her that another London trip didn’t mean she’d been left behind. But, in the end, she didn’t make it. Instead, the slick BVUK organiser shoe-horned ex-Navy brother Martin in to the guest list so we could treasure the occasion in her place and memory. There was space, time and quietitude enough for walking the paths she had trod so proudly, re-touching the sculptures she triumphantly found me. An utterly devoted gardener for decades, such special access was a delight – with the pomp and circumstance giving her that extra swagger. We sipped tea and lemon barley with another brother and sister. They were truly remarkable: he was an RAF policeman until an accident caused debilitating head injuries and blindness; she had given 15 years to battling for his independent living with a war pension and medical compensation. One’s own story fades in to insignificance. Exploring the gardens was the crunch of gravel and the rumble of traffic beyond the walls that envelop summer heat. Heron statues on impossibly slender legs trembled to the touch. 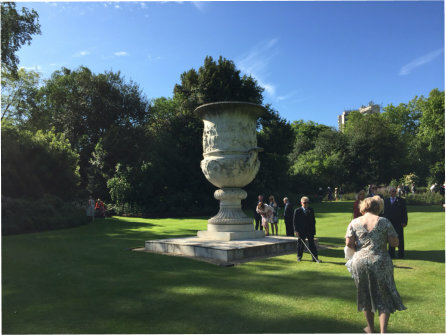 The huge stone urn’s massiveness was impossible to encompass even standing tall on its plinth. 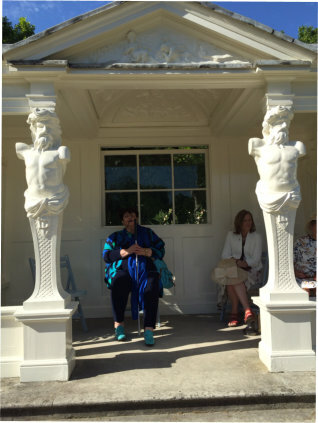 Nearby, a bevy of life-size armless mermen, chests warm and smooth from years of paint, buttress a garden chalet in odd juxtaposition with the domesticity of its rear sash window. What a glorious combination of courage and custom, eccentricity and elegance, pride and patriotism –both the Palace and the people there that day. One national institution honouring another, the men and women who have served and the generosity of those who give us a hand-up rather than a hand-out. 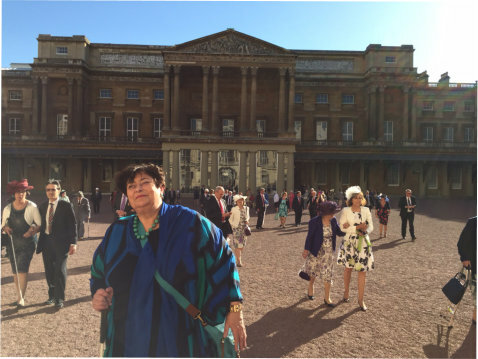 August 3, 2015 pennymelvillebrown	blind, Blind Veterans UK, Buckingham Palace, BV UK, Martin Melville-Brown, penny Melville-brown, Royal Garden Party, St Dunstan’s.